Today we had to put Abby the cat to rest. Almost 20, she “did it her way,” as Frank Sinatra sang. Aloof in her early and middle years, Abby mellowed dramatically in later life, suffering through our attention and petting, I suspect, as a way to siphon off our body heat. She was always cold. Six years ago, I wrote a blog post about Abby when I was running the marketing for an eLearning company that focused on process improvement and product design. I looked for it today, and though they have since removed it from their website (! ), I was able to locate it via the Wayback Machine. Nothing dies on the Internet. I present it as a way to honor the memory of the extended life of sweet, dear Abby. Certainly not my best work, but a classic Abby story. Yes, I still have the cat, for now. March 09, 2009 – This morning, my cat threw up a hairball on my iPod. I kid you not. As the, well, regurgitation, soaked in through the front navigation wheel, I saw enough to know that there was liquid mixed in with the delicate innards. This was much like the “coffee on a laptop” scenario, so I knew not to turn the iPod on. But will it still work, and what does this have to do with e-Learning and design? There are two important connections. First, my online search for “iPod and water” (“iPod and bile” was never a realistic candidate) reinforced an important tenet of Blended Learning. Many people mistakenly believe that Blended Learning is simply a combination of e-Learning and instructor led training. In actuality, effective Blended Learning is much more. It is defined as learning from many components, including e-Learning, coaching, live classes, online sources, blogs, forums, simulations, team exercises, and even textbooks. Self directed learning from online technologies (e.g., YouTube, Facebook, Second Life) is also included in the recognized Blended Learning sources, and is one of the fastest growing methods used by professionals to advance their knowledge. After the adrenaline rush, it occurred to me that my own use of Google represented a now-ingrained and non-traditional learning method. Second, I realized that if my iPhone had been the victim, I would probably not have had a crisis at all. As we all know, Apple constantly modifies and improves its designs, and my phone has a fairly seamless front surface that would not have allowed the, um, cat liquids, to penetrate. The lack of a keyboard is a breakthrough innovation that still triggers curiosity from non-owners, and the nearly solid surface is just one aspect of the overall design. If only I had left my iPhone on the buffet last night. So, will my iPod still work? Online forum advice leads me to believe that the odds are good, as long as I keep it face down and in a warm dry place, like a car dashboard. I now have it positioned far away enough from a space heater to warm – not toast – it to dryness. It is resting comfortably, with a positive prognosis. Perhaps I will try to turn it on Christmas morning and receive my own little holiday miracle. I woke abruptly at 5:30 AM. My wife was shouting from the kitchen. A field mouse had become trapped in our double sink, struggling to get out like some sort of miniature mastodon in a prehistoric hot spring basin. As “master of the house” (in name only), I was expected to leave the warm comfort of the bed and usher the mouse off to its next incarnation. 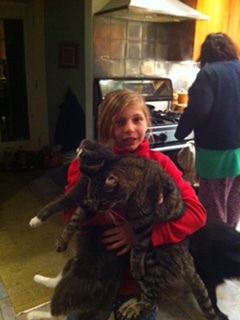 Two cats in the hand is worth one in the bush. I wasn’t surprised. This was the second one we’d caught in as many weeks, though the other had left a endless trail of mini-poops in the basement before we’d captured him. I had no idea where this new one had been living. I am still afraid to look in the lower cabinets. Rodent safely dispatched, I crawled crankily back into bed. There, waiting for me, was Malcolm, our 16-year-old striped tabby. He and his sister Abby – now 19 years old – were useless as mousers, one of their supposed “responsibilities.” They’d let me down yet again, and I was overwhelmed with disappointment. Was it time to put them on a PIP? For those who don’t know, a PIP, or Performance Improvement Plan, is a popular way to get rid of an employee when you don’t want to be sued. The supervisor documents that the employee isn’t meeting his or her job requirements, sets a very high bar, leans back and monitors the employee until enough time has passed to safely let him or her go. A PIP is a not-so-gentle hint that your time will soon be up. PIPs are a response to poor performance, but they’re also used for personality conflicts or in a culture that prizes tough love over nurturing. To my mind, it’s a cowardly and disingenuous tactic practiced by managers too afraid to fire someone. PIPs offer false hope, and on the rare case that the plan is cancelled, the employee never stays long after the painful experience. Of course, I knew a feline PIP was never an option. First, they’re cats, which means I am their de facto employee, and you can’t PIP your boss. Second, mousing is a sport for the young. At their advanced ages, our cats are quite adept at survival skills that include napping in the sun, caterwauling for attention, and licking their bowls shiny clean. They are performing admirably. And finally, as I drifted back to la la land, with Abby settled on top of me and Malcolm under the sheets purring against my chest, I fully understood why I could never axe these two. They had me right where they wanted me. NOTE: I owe a debt of gratitude to Troy Williams for his influence on this post. Many years ago, he gleefully explained the true meaning of a PIP to me, painfully ripping away my innocence like it was a particularly sticky band aid. Up to that point, I had actually believed a PIP was for the good of the employee. Oh, naive Larry. I miss you so. A few weeks ago, I received a memorable lesson in sportsmanship via my daughter, the gymnast. This got me thinking about integrity, the abundance – or the glaring lack of it – in the office place. I’ll explain. A few weeks ago at family dinner, our ten-year-old daughter proclaimed that it was time for a stricter coach who would stretch her limits and accelerate her gymnastics skills. In our role as supportive parents, we reached out to a few of the local gyms, and she was invited in to shadow their teams and show her potential. A week later, she was officially asked to join her first choice, and she gladly accepted. The take-home lesson came when the head coach of her old gym asked her to drop by one last evening at the end of practice to bid farewell to her old teammates. It’s the formal custom of that gym for all departing members, and my daughter was nervous. What should she say? How should she present her decision? Why was she even being asked to do this? SPORTSMANSHIP: A seminal lesson in how to respectfully handle change, even when it brought up feelings of loss or disappointment. So why can’t adults act this way at work? The next day on my long commute to work, my mind kept returning to how well the old gym had pulled off the departure of one of their athletes. The coaches had honored the efforts and achievements of my daughter and dealt with the issue in an open and dignified ceremony. How common is that? I think not at all, especially in the hard scrabble world of commerce. Over the years, I’ve certainly seen my share of poorly handled sudden departures. The guy who disappeared in a sulfurous cloud of unconfirmed rumors regarding an online gambling addiction. The women who felt passed over by their manager, left the company, and later successfully sued for discrimination. The disgruntled secretary who was let go after one too many arguments with the boss. The intern who one day just stopped showing up. Sadly, in many organizations, staff departures equate to no sense closure, reveal few consequences, and take place with zero dignity. The former teammate is immediately persona non grata, his desk and belongings stripped away by an underclass of office supply scavengers. Next comes weeks of trash talk about the former employees’ shortcomings, parentage, and peccadilloes. I avoid this poisonous gossip like the measles. My personal policy: “never speak ill of the dead.” Not being in HR, I am fuzzy regarding the rules of what management can and cannot legally say. But I do know that real leaders are those who opt to tackle – and not ignore – these awkward circumstances.Treating departing employees with dignity is exemplary sportsmanship, played out courageously on the field of business. When a manager takes the time to say something kind about the individual, to recognize her positive contributions over the ultimately negative outcome, he or she is demonstrating a commitment to a culture of respect. “A man lets you know who he is by how he treats others,” said the basketball player Mo Williams. The coaches at my daughter’s former gym proved without a doubt last week just how much they care for all the girls and boys they train.